Beneficiary Deeds - How to use them in Arizona to avoid probate. 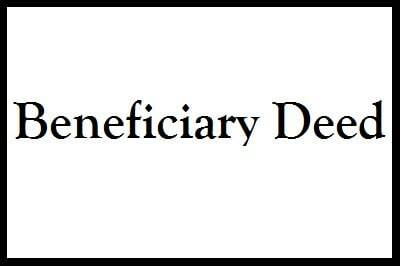 When someone dies a beneficiary deeds can help define who gets title. It is wise to sign and record them before the owner of the estate dies. He or she may do this at any age. These deeds are commonly used when the owner of the estate is advanced in age. Furthermore, it allows the owner assurance that a specific loved one will inherit a piece of real estate. Furthermore, it is efficient, and inexpensive. Why don’t more people consider this simple, yet powerful tool? It is often simply a tool that people are unaware of. People don’t generally know when they will be dying. This is another reason why these useful deeds are not used more often. First of all, beneficiary deeds are not always the end all to every Arizona estate that holds property. These documents are able to transfer ownership after death. Prior to dying the owner may sell or refinance. While not complicated to prepare any mistakes made in the document preparation could come back to haunt you. Furthermore, it can cost thousands of dollars in legal fees to resolve when these deeds are not correctly prepared. So, the money saved up front by not hiring an attorney can pale in comparison to the fix. The cost of having an attorney fill out one of these deeds can range from $100 – $300 and up. This is chump-change compared to the cost of correcting a poorly set-up deed. Most title companies in Arizona have a form that suffices. Of course, you should consult an attorney before submitting the deed for recording. You can download this blank beneficiary deed provided by Lawyer’s Title of Arizona (received 2/24/17). The cost to record the document in Maricopa County is currently less than $10. For more information about probate check out the Attorney’s Explain page. There’s a ton of great information to be had there.